A confession – I was not a fan of the Lancome Tresor perfume because I found it too strong. It also smelled it like would suit an older more mature woman better. 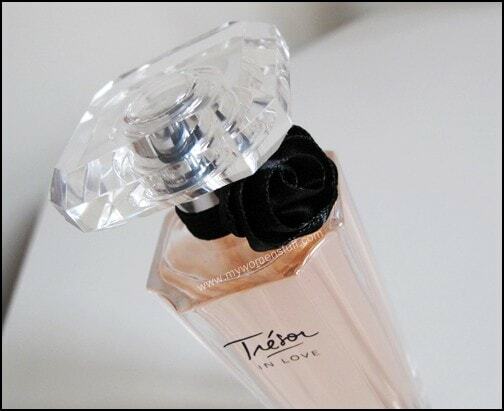 When I saw the Tresor In Love version, I was surprised because Tresor comes in a short squat bottle but Tresor In Love comes in a tall elegant bottle marked by a satin black rose around the top. It somehow brought to mind a flamenco dancer. The thing is, I really like Tresor in Love! It is light and not too floral, sweet without being cloying and fruity while just offering you a hint of sensuality. Its a fragrance for falling in love. The fragrance is lovely and because its light, dries down to just a hint of a scent on me. Fortunately, the scent does not change too much on my skin – fragrances do sometimes do that so I start out the day smelling fresh as a daisy and end the day with a fruity floral scent with a hint of musk. Quite perfect for me. I love the packaging and it sits prettily on any dresser with the pale peach-pink liquid filling the heavy but elegant glass bottle. The only gripe I will have is the cap. It looks like cut glass but is, I believe, a heavy clear plastic. Not very cool. If you like the original Tresor scent, think of it as a fragrance for long sensual evenings, and Tresor In Love for the day or casual weekends. Tresor In Love fragrance comes in 3 sizes – 30ml, 50ml and 75ml. Not sure of prices but I think the 50ml bottle is RM200. Isn’t it so … French? 😀 Did you notice the white dress worn by Elettra Rossellini (daughter of Isabella Rossellini)? I love it! PREVIOUS POST: Do fake products stop you from owning the real thing? I like Tresor because it smells quite unique but it is a tad strong at times like you mentioned. I have the miniature but never got around to getting the full-size since I got Magnifique instead. That just finished so Tresor in Love may be going to the top of the list now 😀 Thanks! I love her dress too! I have a belt that’s exactly like that. Vintage. Got it from dressforyesteryear.blogspot.com. Came with a “stepford wives”-ish polka dotted dress. I thought Rosselini’s daughter is quite pretty. In a more doe-like sort of way. Paris – So is the perfume attracting any hot french guys from across a crowded room? As hot as the one in the ad? Hehe. Oh wait…. there aren’t any hot french guys in Msia. Sigh. Tresor is a bit too strong at time. Never able to finish the whole bottle. Only use it occasionally. 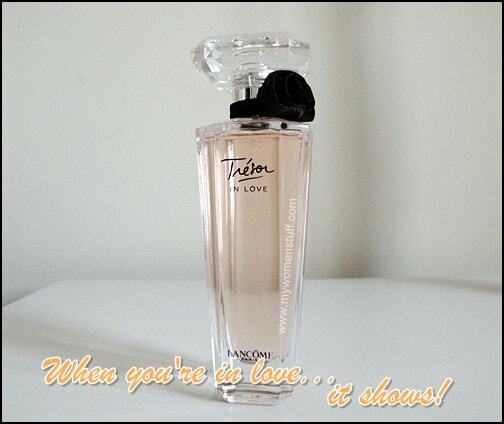 I’ve received a sample of Tresor In Love and I like the smell a lot. Well, I plan to purchase a bottle and will use it on a daily basis. As for the bottle, didn’t look attractive enough. I love this fresh clean smell! The ad is like Armani’s Code though.. Does anyone know what dress it is that she’s wearing? And where I can get it please? Carla, I tried to find the dress in the internet but there is nothing said how the advertisement was created and what designer made the dress! so, if someone find it tell me please!!!!! So im getting married on feb 14th in hawaii and i am looking for that dress everywhere! Cant find it! Please help.